RTS-League / Forums / Tale of the Dragon Joins RTS League - Sign Your Clan Up! » Tale of the Dragon Joins RTS League - Sign Your Clan Up! Tale of the Dragon Joins RTS League - Sign Your Clan Up! Tale of the Dragon, the latest addition to our beloved Age of Mythology, is out for half a year already, and it's about time to try and give it a spin for some proper competitive fun! RTS League is proud to announce the hosting of the first big event the new expansion will see, and we are sure hoping you will join us in having fun with this intriguing new way of playing AoM - can you be the first Champions of RTS League's Age of Mythology: Tale of the Dragon Clan League? RTS League is a renowned "Age of" competition focusing on supporting the clan scene in the community, and we are aiming to do the exact same here - the competition will be an RTSL-style clan tournament focused on 3v3 battles, aiming to provide a place for some fun and friendly competing. That means that otherwise we are keeping any limitations to a bare minimum, allowing you to play the game as you see fit to enjoy your time at RTS League the most. So, are you ready to join in the fun and rise to fame and glory the same as the clans in our Age of Mythology: The Titans Clan League? Tsunami Clan, AbsoLads or Deities of Death are awaiting company in the Hall of Fame, and it's about time some new names entered the history - everyone is waiting for you, so don't waste any time, read on and sign up! As we've said above, with this inaugural Tale of the Dragon event, we're aiming to test the waters a bit, as there hasn't been a competitive tournament yet, and so we want to allow the clans to play as they see fit to show everyone what possibilities the game provides. At the same time, there already are certain parts of the game we know are problematic, and so we'll need to cover them in the rules. Due to the fact that we cannot be sure about the exact number of signed up clans, and that we want to keep to a certain schedule, the specific format as to how the competition will go is still to be decided, exactly based on the response we get. This means that the final rules will be published with the League's start, but don't worry, no surprises will be waiting in line, we will follow our current AoT rules as guideline, we just want to make sure everything fits the way we want the tournament to go. - Clan wars (no random teams, there needs to be a clear affiliation of players, such as all being members of AbsoLads, or Deities of Death, etc.). - 3v3 default, 2v2 possible if both clans agree (we would like to ask clans to be lenient here and support playing games even as 2v2 rather than not at all - this is a fun event first and foremost). - Supremacy default, clan can choose Conquest on its home map. - There will be a group stage, its form and potential Playoffs are to be decided based on the number of signed-up clans. - Match consists of 2 games, home map for each clan (potential Playoffs would then be Best of 3, maybe 5). - Each round is to be played in its given 1 week (Mo-Su). - Date of the match is to be scheduled between clans through their Clan Operators using our forum within the given week. - All games must be recorded. - Selectable only if both clans agree: Nomad (same reason as in AoT - Atties), Deep Jungle (often seriously buggy spawns, such as cut off TC, hunt), Team Migration, Vinlandsaga (these two do not spawn transport ships for Chinese). Basin, Old Atlantis, Silk Road, Yellow River - do not spawn players according to their team. Even through the bugs, it would be cool to see them played as something new, so we're again asking clans to be lenient if your opponents want to choose a map from the above. - Due to the problematic optimisation and high demands on players' computers, plus sometimes problematic connecting, lag/stutter is unfortunately to be expected in big team games. We urge players to make all possible effort to reduce these problems through switching off all unnecessary applications and reducing all options to a minimum, to have back-up players ready to switch in, to switch to a 2v2 if necessary, but if all options have been exhausted, the games must go ahead nonetheless. Remember, this is a fun event first and foremost, and as such, played games are a top priority. - Streaming will be mandatory if an official streamer is present. - All Clan Operators and players involved in the season need to be members of RTS League's Steam Group for easier communication between each other and with staff. - If both clans agree, Titans may be turned off. Besides these specifics, consider the Rules for the AoT Clan League as a point of reference for how would certain situation be handled, and what clans and players need to adhere to. As usual, in all cases, the League Staff will have the final decision. The goal of the League is to ensure fair play and fun for all participants. Abusive tactics, such as hunt deleting or building excessive wall segments (e.g. 1x1 wall pieces spam) near settlements, gold mines, or wonders, are not permitted. Using Kronos' Time Shift and Poseidon's Lure on the map King of the Hill, in order to control the vault, is also prohibited. And now how to sign up! 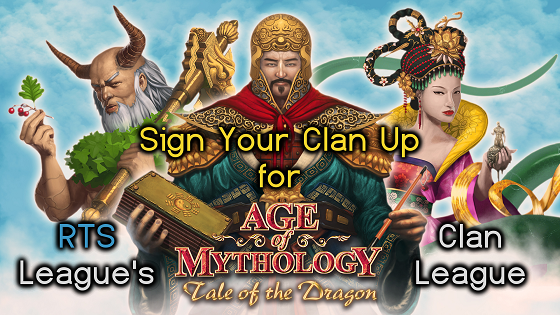 To take part in the prologue to our brand new Tale of the Dragon Clan League and have a chance at the fun (and the Banners ), your clan will need to fit a few conditions to ensure you would be a positive contribution to the League. Further you need to be familiar with the League rules stated above, and that will be finalised with the start of the season. Read them carefully, and pay attention to the original rules for the AoT Clan League as well. Sign-ups will be closed on Sunday 7th August, the season will start the following week. As we've said, we'll try to cover as many matches live as possible, and for that we'll need a dedicated crew of casters. If you'd like to help in this regard, please contact us (Careful to replace the addressee line with my nick - Black Adder ) with some information about you, such as your usual availability and your timezone, plus your stream settings (resolution with potential downscale, bitrate, internet speed) and your computer specifications, to have an idea what to expect and if the streaming of high-computer-taxing team games is viable (mention how your experience with Tale of the Dragon is in these regards). Also let us know if you commentate in English or just stream, if you have streamed Tale of the Dragon, and send us links to your Twitch and past streamings. That seems to be about it then for the time being, so sign up if you have a clan, or follow us and the TotD goodness if not! Btw we're always on the lookout for community members eager to help their fellow players enjoy the game we all love even more! So if you'd like to help us bring RTS League and the fun it offers to the community to the next level and join our team, be sure to message me (careful to replace the addressee line with my nick - Black Adder ) with your ideas and how do you think you could help us and the community improve! Re: Tale of the Dragon Joins RTS League - Sign Your Clan Up! BA, I don't see anything in the rules about signing up two teams. Hopefully, two teams are allowed per clan. KeeN has a diverse group of players, this will allow the lower level clan players to participate as well. We're not counting with it as we want to ensure clans are able to participate fully and deal with problems comfortably in this new and untested environment, and also because there is a high chance just one division will be filled, in which case multiple teams from the same clan do bring other issues as well. Clans can, however, post in their application if they'd like multiple teams, helping us see what is the situation. Looking at the number of sign-ups, we're thinking of an alternate solution along the lines of an exhibition event between you clans, as we'd still like to host a Tale of the Dragon event, and we're sure you'd like to play competitive games on the new expansion as well, so please stay tuned and we'll inform you about further details. Sounds good, hopefully there's some kind of tag for the winner.